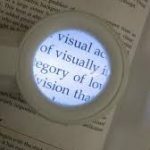 Low Vision refers to the condition of having reduced visual abilities. In contrast with blindness, people with Low Vision maintain some degree of functional eyesight. Yet, typical daily tasks may be a challenge, which can make life into a frustrating experience. Our experienced eye doctors understand the difficulties of living with low vision, and we offer various methods of low vision assistance to the NYC metro area. With the right strategies and tools, we can help enhance quality of life for people with low vision.